How are 360 Videos Made? Are the new GoPro Hero4 cameras compatible with 360Heros holders? Do you have a comparison of the cameras that go with your rigs? Does the GoPro Hero 3 PLUS work with the 360Heros video gear? Yes! The Hero 3 and Hero 3+ cameras are 100% compatible with all of our gear. The change from Hero 3 to Hero 3+ allows for crisper and clearer content, along with new low light control. So the Hero 3+ will allow for more power when shooting night scenes. We have experimented in mixing the two cameras on the same 360RIZE camera housing, and we did notice a difference in the quality of the video between the different cameras. So it is recommended that you use either all Hero 3 or all Hero 3+ cameras on the same 360RIZE housing. What settings should I use for the 360H6, H3Pro6, H3Pro6n and H3Pro7? Used for models 360H6, Pro6, Pro6L, Pro7, , Pro10HD*. * H3Pro7HD and H3Pro10HD can support multiple camera settings (see next section for only HD model settings). It is highly recommended that you use the Hero3 Black cameras to get the best performance, resolutions and colors. Hero 3 and Hero 3+ Black Settings (Recommended) either mode can be set and this controls the output resolution after the 360video stitch. Hero 3 Silver Settingseither mode can be set and this controls the output resolution after the 360video stitch. Hero 3 White Settings either mode can be set and this controls the output resolution after the 360video stitch. These are the camera screen settings for the Hero3 Black or Hero3 Plus. It is best to shoot in 1440 mode, 48fps, ProTune on, and White Balance RAW. What settings should I use for the H3Pro7HD, H3Pro10HD? Pro7HD and Pro10HD can support multiple camera settings (you can use the settings from the previous section for a much lower resolution, but it is recommended that you use the settings below for the HD rigs). It is highly recommended that you use the Hero3 Black cameras to get the best performance, resolutions and colors. Hero 3 and Hero 3+ Black Settings (2.7K MODE HIGHLY RECOMMENDED) either mode can be set and this controls the output resolution after the 360video stitch. · 2.7K (8000x4000px) (16:9 ratio) at 30 fps (final size is around 7800 pixels by 3900 pixels) · 4K (12000x6000px) (16:9 ratio) at 15 fps (final size is around 11800 pixels by 5900 pixels) These are the camera screen settings for the Hero3 Black. It is best to shoot in 2.7K mode, 30fps, ProTune on, and White Balance RAW. What settings should I use for the 3DH3Pro12, 3DH3Pro12H, 3DH3Pro14? The 3DPRO can support multiple camera settings. It is highly recommended that you use the Hero3 Black cameras to get the best performance, resolutions and colors. Hero 3 Silver Settings either mode can be set and this controls the output resolution after the 360video stitch. It is also HIGHLY recommended that you use 360CamMan to help you manage the data files from the SD cards prior to inserting it into the camera. It will help keep the Left and Right eye configurations working correctly. How do I install and uninstall the GoPro cameras? Check out this video which will lead you through the install process. Does 360Heros offer professional 360 video hosting services? Yes. Due to the overwhelming response, we will also offer a logo-free branding service. This is where you can upload your own videos, much like YouTube, and brand your own content. Over the next couple of months, you will see the site migrating to this new format. Start by going to http://video.360heros.com/. In the upper right corner, click ‘sign up’ and fill out the details. A verification will then be sent to you via email. Approve this link and you can now login to the system and upload your videos. The login link is located in the upper right corner of the page. How do I upload 360 videos? First you must sign up; please see the directions above. You can now login to your account in the upper right corner of the page. You will then be prompted to provide a name for the video, producer, and video location. Choose a category for your video, as well as the 360RIZE mount you used for filming. You can then upload your video, along with a thumbnail and logo, which are required. You also have the option to password protect your video. Please keep in mind that the maximum file size is 300 MB, but there is no limit to video length in time. If you find that your video is too large to upload, you can adjust the bit rate to 5 or 8, and that will drastically decrease the video size. Your video can be immediately iframed into your own site and viewed under your login account. However, in order for it to be viewed on all mobile devices and public to the web, we will have to approve the video content. We will also help verify if the video is optimized for mobile and web viewing. A common problem that we have discovered is that the video is not properly formatted or web optimized. When you go to play the video, the length of the video should immediately show and you should see the streaming bar slowly move on the video timeline below. If this does not happen, then the video is not properly optimized for web viewing. Please see ‘Creating Optimized 360 Video’. Can I password protect my videos? Yes, if you would like to password protect your video, you will be prompted to provide a password on the video upload page. Is there a maximum file size for video upload? Yes, the maximum file size is 300 MB, but there is no limit to video length in time. If you find that your video is too large to upload, you can adjust the bit rate to 5 or 8. This will drastically decrease the video size, however it could change the quality of the output. Do you have sample footage available for 360 video? You can find sample footage available here. This was taken with the H3Pro6 model. Do you have sample footage available for 3D 360 video? You can find sample jpg and mp4 files here. This was taken with the 3DH3Pro12 model. What software will I need to stitch the 3D 360 video? You can use either Video-Stitch or Kolor to stitch your 3D videos together. While Kolor will generate a stitch for you as a drag-n-drop solution, Video-Stitch will allow for more control in manipulating the image. Is the 3DH3Pro12 compatible with GoPro Hero3 or Hero3+ cameras? Yes, all of our gear, including the 3DH3Pro12, is compatible with the GoPro Hero3 and Hero3+ cameras. Is there demo video taken with the 3DH3Pro12? Yes, you can download sample footage here. How does the 3D 360 Video Work Flow work? Yes, full spherical 3D 360° video can now be accomplished using the same technique as the above two-camera system! Three different camera array configurations of the 12 or 14 GoPro® Hero 3 cameras creates 6,000 by 3,000 pixels, fully spherical 3D 360° by 180° video. Using the GoPro® Hero3+ Black camera remote, you are able to sync all cameras, and create 12-14 video streams that simulate the left and right eye in a full spherical array. An upfront challenge for us was file management for the numerous cameras, as well as grouping into two separate equirectangular files for stitching. Using our new 360CamMan software, files are renamed and organized by camera takes and grouped into left and right eye sets. The software even checks and identifies file sizes and video length to ensure each take is properly matched up. Post-production is more complex than two-camera editing, however we’ve reached a real milestone in designing an end-to-end workflow process. Post Production Work Flow – We are using a variety of tools to create the 3D 360 Video stenographic views. First, the content is uploaded to our 360CamMan File management software, and Video-Stitch or Kolor is used for video stitching (we supply all the templates for Video-Stitch at no charge). Then Adobe Premier or After Effects is used in conjunction with Vision3’s plugin (download link below) to create the stereographic views from the equalrectangular view created for the left and right eye. Next, everything runs through HandBrake to optimize the video to the proper resolutions. Finally, we use open source VR Player to play the 3d 360 video content on the Rift or our 360 video hosting center, which will display your content on the web, IOS, and Android devices. What is the best computer hardware for stitching 360 video content? The following links will direct you to our recommendations for purchasing the “ultimate stitching machine”. These packages are ranked with “#1” being our strongest recommendation for the best hardware package available. Do I need to use a third party stitching software? Yes, and there are multiple solutions. The first is Video-Stitch which is used in conjunction with PTGUI. The second is Kolor, and they have the complete package. What do you recommend for video stitching? For video stitching, we recommend that you download the trial versions of Video-Stitch, Kolor Basic, or Kolor Professional. Can I view my panoramic video or photo on any player? Yes and no. Basically, 360 video content can be played using the player on our website that you can brand with your own logo. It requires Flash in order to play correctly. There are other solutions out there that use HTML5, however this technology is very new and doesn’t have as many features as the Flash Player. You can play the Equalrectangular version using a standard Windows or Media Player provided that the output is readable via your system’s codex. For example, the program VLC is a free open-source package that will play Equalrectangular videos in any size. How long will it take to stitch my videos? Using Kolor Basic, which uses CPU to stitch, one minute of video at 48 FPS takes about 45 minutes to stitch, on average. VideoStitch is a faster GPU based alternative. However, this software requires you to purchase an NVidia graphics card in order to run it. With VideoStitch, one minute of video takes about 1.5 minutes to stitch. VideoStitch is compatible with PC (recommended), Mac, and Linux. Can the 360Heros 360 Video Player Template be branded with my logo? Yes! The template can be branded with your logo, overlays, etc. However, we only support the existing software as it is written today. If you modify the source code, it voids all warranty. The template is designed so you just replace the JPG or PNG images and the player will function normally. What methods do you suggest for video file management? Then you will see a blue arrow “click here to download files you’ve purchased” click on that link. Do you have sample footage for stitching practice? Yes! You can download it by clicking here. Is there an app to view the 360 content on IOS or Android devices? We will soon release a free IOS app, Android app, and free 360 video web hosting service for all of our customers. You will be able to list your production company, your content, it can be password protected, and it uses the accelerometer and gyroscope for navigation for you and the world to see. We will send out an email once this comes together, and you will then be able to download it from the site. Is there a tutorial or other helpful information for Autopano Video? Here is a nice tutorial video on getting started with Autopano Video and here is some supporting documentation to help you troubleshoot. Do you provide support for the 360Heros video gear? Yes, we provide a wide variety of support services, from sending people to you on site or via Skype and video training. Do you have partner programs? Yes, we do have partner and affiliate programs. Depending upon your qualifications, certifications and resale ability, we can set you up in any of these programs. Currently our dealers need to be certified in order to sell the 360RIZE gear and the Kolor and Video-Stitch software. However, we are 100% willing to work with you. First, you must sign up for an affiliate program on www.360rize.com. Then we will be able to set you up as a dealer. Do you provide 360 video stitching services? Yes, we provide a whole array of video stitching services. From shooting techniques to file management to stitching in a wide variety of resolutions up to 12K format. Many times we work directly with the production house because we deliver the content in RAW format in image sequences, so your post-house can color correct to your liking. Or we can color correct for you, but many times the producers want to do this themselves. Because our stitching services range from on-site filming, to stitching content that you shoot, we will need to understand your project in order to provide you with pricing. What type of project will you be working on and what is the scope of the work on our end? You can email those details to support@360Heros.com. Also, if we are stitching your content that you will film, we do require a training process for filming up-front to ensure the best stitch. I don't know which 360Heros camera mount would be the best for me. Do you provide consulting? Yes, we do provide consulting. From shooting the content, rigging the gear, using the GoPro cameras in all of the different formats with tips and tricks as to why you would use the different video gear products to match your production needs. For example, some 360Heros video gear works great on drones and UAVs, while others are best to wear on athletes or other action sports. Where do you ship to? When should I expect my 360Heros gear? We currently ship world-wide with exception to those countries with which the United States has embargo or restrictive trade sanctions. For the current list, please see: http://www.treasury.gov/RESOURCE-CENTER/SANCTIONS/Programs/Pages/Programs.aspx . Most often, your 360RIZE gear will ship within 24 hours. Thus, when it arrives at your door will depend upon your chosen shipping method and speed. Are taxes and shipping included in your product costs? Yes and No, taxes are included in the product cost for the US. However, each country has its own rules and regulations and you may have to pay import taxes. To understand your shipping costs, they will be calculated after you choose your shipping method and enter your shipping location. Do you provide 360 production services? Yes, We offer a wide range of production services. What type of production do you plan on doing? What type of final output are you looking for? Dome projection, web player, and/or mobile device? This makes a big difference in how you shoot the content, rig it, and stitch it. We also offer on-site services for shooting content, as well as stitching your content. We would turn over to you high-resolution JPG image sequences that are stitched and ready for your color correction. Yes! We offer a 50% student discount as part of our 360Heros Educational Partnership Program. You can find more information and submit an online application here. To qualify, you must submit a 500 word essay on how you plan to use our product/project description, a scanned copy of your student ID, and any other supporting photos or documentation. Upon receiving all of the required materials, you will be issued a one-time use student coupon code. We also ask that after completion of the project, you submit your video to us so we can feature you on our student spotlight page. This page will be created specifically to highlight student projects and videographers. Can you tell me how much it will cost to ship my 360Heros gear? Our system is set up so that, once you have your items in your shopping cart, it determines approximate weight. Then the customer must choose a shipping method and this will determine your shipping costs. The customer can actually go in and place an order with chosen shipping to get a final cost prior to actually paying for the order. We don’t actually do shipping estimates because this is so variable. Again, you do not have to complete the order with payment to get a shipping estimate. What is the difference between the Good Weather and All Weather kits? The Good Weather Kits are designed to be used without the GoPro housings and are better to use when it’s not raining or snowing. The All Weather Kits are designed to be used in harsh environments, such as snow, rain, or action sports where the camera could come into contact with the ground. How will quality be affected using each? Using the GoPro housings in sunny conditions outdoors, you may get a glare off the housing. So in those conditions, if the weather is good, it’s best to use the video gear that does not use the housings. In the case of the 360H6 compared to the Pro6, it all has to do with the distance that the subjects are from the camera. The Pro6 shoots best if the subjects are at distance of at least 3 feet (1 meter), while the 360H6 shoots best when the subjects are at lease 4 feet (1.25 meters). With both models, in all cases, they shoot great from 4 feet to infinity. This is all due to parallax between the lenses. How do I create high-quality 360 video using 360Hero mounted on a UAV? There are four different 360Heros models that work well for the UAV: the Pro6, the Pro6L, Pro7, and the Pro10HD. We have tested all of this gear and the first three models will stitch to resolutions as high as 6,000 x 3,000 pixels. The Pro10HD will stitch to 12,000 x 6,000 pixels, however with this unit many people use the lower resolution at 8,000 x 4,000 pixels. What do I need for underwater 360 video? What do you suggest for 360 video street view? The Pro6 is the best model for the following reasons. First, it stitches to resolutions as high as 6,000 x 3,000 pixels. You can gain access to the external USB ports for external power. You can also shoot in both video or photo mode and use either method for stitching. For example, if you use photo mode for time lapse, you can capture content to lengths of 4-5 days depending upon the size of your micro SD card. 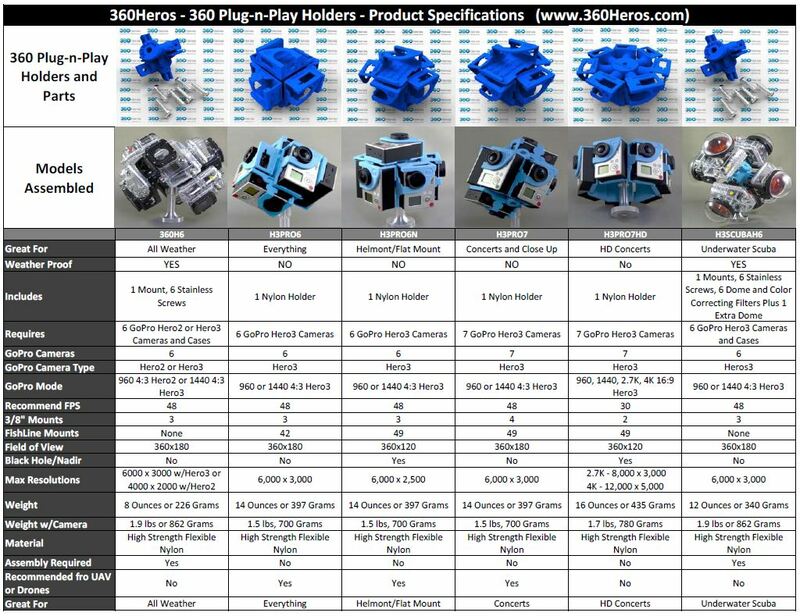 Do you have product specifications for 360Heros gear? Here is a product comparison guide to help you make the right choice for you. Can 360Heros gear capture 360 panoramic still images? Our gear uses the GoPro Hero 3 and Hero 3+ cameras; these cameras do have the capability to shoot stills, as well as video. The images must still be stitched together, however, using Kolor or Video-Stitch.